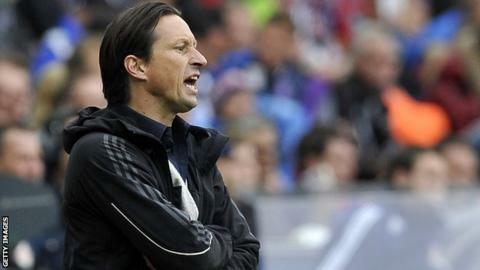 Bayer Leverkusen have appointed Red Bull Salzburg coach Roger Schmidt as successor to the sacked Sami Hyypia. Schmidt, 47, has signed a two-year deal with Leverkusen, who are fourth in the Bundesliga, and takes over in June. Newspaper reports claim ex-Manchester United boss David Moyes was ruled out of the running by Leverkusen bosses. "We sounded out the market and very quickly made up our minds to opt for Roger Schmidt," said Leverkusen sporting director Rudi Voller. "His approach to playing football fits perfectly with us." Former Liverpool defender Hyypia, 40, was dismissed earlier this month after Leverkusen won just once in 12 matches. Under Schmidt, Salzburg won this season's Austrian league title in record time - with eight games to spare - and reached the last 16 of the Europa League.